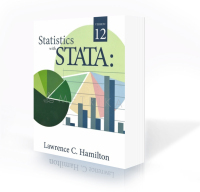 Statistics with Stata: Version 12 is the latest edition in Professor Lawrence C. Hamilton’s popular Statistics with Stata series. Intended to bridge the gap between statistical texts and Stata’s own documentation, Statistics with Stata demonstrates how to use Stata to perform a variety of tasks. The first three chapters cover getting started in Stata, data manipulation, and graphics. Hamilton then introduces many statistical procedures available within Stata. These include summary statistics and tables, ANOVA, linear regression (and diagnostics), robust methods, nonlinear regression, regression models for limited dependent variables, complex survey data, survival analysis, factor analysis, cluster analysis, structural equation modeling, multiple imputation, time series, and multilevel mixed-effects models. The final chapter provides an introduction to programming. The organization of this book makes it ideal for those who are new to statistics, experienced statisticians who are new to Stata, and Stata users wishing to explore Stata's capabilities in a new field. A series of example commands with brief descriptions at the beginning of each chapter demonstrates the Stata syntax for topics discussed in the chapter. For those already familiar with the statistical technique but not with the corresponding Stata commands, this example section may be all that is needed to begin an analysis using Stata. Following the example sections, Hamilton addresses each topic in more detail with descriptions of statistical procedures, examples using real data, and interpretation of the Stata output.